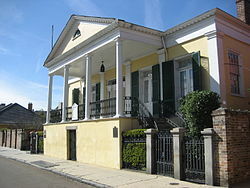 Beauregard Keyes House — The house at 1113 Rue Chartres was built on two lots of ground that were given to the Ursuline nuns. In 1824, the nuns decided to sell off the lots. An auctioneer and businessman, Joseph Le Carpentier, bought them and contracted with an architect from Baltimore, Francois Correjolles, to design a house and garden. The house has had numerous owners over the years including the author, Frances Parkinson Keyes. Mrs. Keyes wrote 30 novels during her time living at the home, including Dinner at Antoine’s and The Chess Players, about New Orleans resident chess master, Paul Morphy. Mrs. Keyes also created the parterre garden. The house features a formal, parterre garden and courtyard complete with central fountain and hedge boarded beds, all surrounded by a brick wall providing a peaceful oasis in the busy French Quarter. 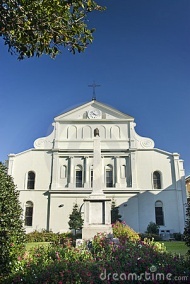 St. Louis Cathedral’s St. Anthony Garden – 3 blocks from the Beauregard Keyes House, tucked away behind an iron fence and locked gate, is the St. Anthony Garden. While a relatively new garden, St. Anthony’s is rich in history. After Hurricane Katrina destroyed the garden, funds were raised to restore the garden to what it was when originally planted in 1720. All the plants used were those listed in the archdiocese’s historical records, including the trees. La Petite Grocery Restaurant and Garden – La Petite is an Uptown treasure trove of exciting cuisine made with only fresh ingredients. To supply some of the ingredients, the restaurant created a kitchen garden. As space in uptown New Orleans is so limited, the garden is a short walk from the restaurant, behind a small Catholic church and tended by Ian, a knowledgeable gardener who is anxious to share the garden and exchange gardening tips with our group. We will have the opportunity to taste some of the items grown in the garden during an exciting luncheon menu that spotlights the versatility of culinary herbs and new twists on traditional New Orleans cuisine. Anne Barnes’ Wildlife Garden – Anne Barnes, a member of the Herb Society of America’s New Orleans Unit, will guide us through her magical uptown garden. Anne has always been a wildlife enthusiast and after her garden was destroyed by Hurricane Katrina, she rebuilt it to attract a wide variety of birds, butterflies, and other local critters. It is an informal garden teaming with life and color. Anne will serve as our guide and is excited about sharing her lovely garden with fellow herbies. Tour is limited to a total of 30 people so make your reservations as soon as possible. Fees must be paid in full at time of reservation to guarantee your slot. Chartered bus leaves Burden promptly at 8:15 am and returns at 5 pm. Cost: $150 per person (HSABR members receive $20 discount on their ticket) – Includes all admission fees, transportation, lunch and gratuities. Spaces are available on a first come first serve basis.